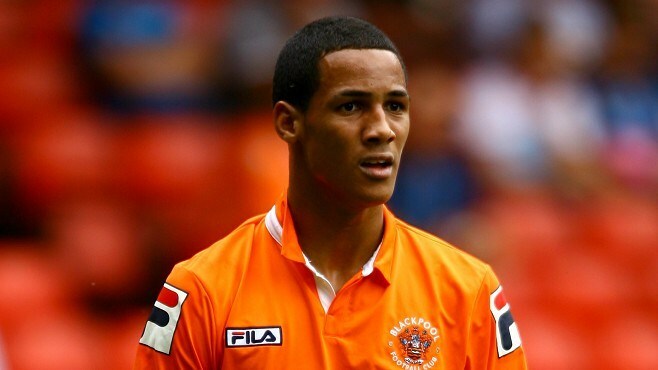 Tom Ince (20) signed for Blackpool from Liverpool in the summer of 2011 and in just over a year he has grown with each game he has played and is now one of Blackpool’s key attacking weapons. In his first season he scored 8 goals and made 8 assists in 41 appearances. This season he already has 13 goals, 9 assists in 20 league appearances. 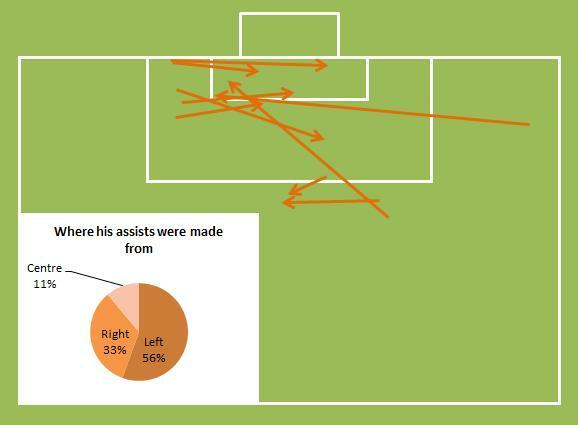 The following two diagrams chart Ince’s goals and assists from this season and the location they occurred in relation to the opposition goal. 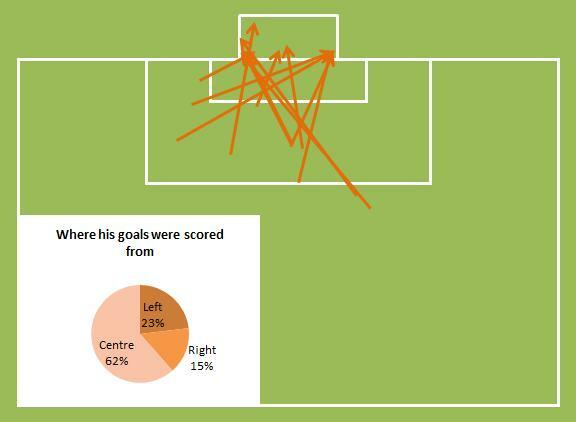 From the diagram you can see that only two of his goals have been scored from outside the box, with the majority of the goals being struck from central areas (please note that he has three penalties in his tally). All but one of his goals were scored with his left foot. What is interesting here is that he tends to start games lined up on the wide right of Blackpool’s forward line, however, 36% of his goals and assists come from the left hand side. This is partly due to him being left footed, but also potentially down to him being rotated from the right to left in games. It’s perhaps the dynamic of a switch that catches defenders cold and not picking him up as he switches sides as much as it is natural for him to play on the left hand side. Upon joining the club the first impressions of Ince were of a young player with pace and a trick, but often prone to running with his head down, narrowing his field of vision. He takes his place in Blackpool’s 4-3-3 as one of the two wide forwards, normally as an inverted winger on the right. His first touch was initially an issue, but he has clearly worked hard on this and he is only prone to the odd error. His passing lacks a little consistency, both in range and execution however, his game isn’t necessarily based on his passing ability. He has good acceleration and sustains his pace well to beat men. His tricks can be a little readable and he could do with adding more subtlety and disguise to elevate his one v one play. However, he clearly enjoys to engage his direct opponent in order to beat him. He seeks to drift off the right flank across the edge of the box looking either for short combinations with team mates or to get away early shots, normally curling left to right. On the evidence of his goals he can hit powerful shots as well as placing the ball with control and accuracy. This is allied to reliable delivery from wide free kicks, corners and crossing from open play. He could, however, do with developing more variety to his delivery. Perhaps developing his pace of delivery and craft to move the ball with more bias towards the end of its flight. It appears that he is mentally strong and doesn’t tend to lose his composure the closer he gets to the opposition goal. Generally speaking he is a team player, willing to track back and support in defence. However, his work back towards his own goal could be sharper and smarter. He could also do with increasing his field of vision to appreciate his options earlier which will also help with his decision-making. In addition to settling in to either wide forward position and has even dropped deeper and centrally at times and realistically he could also be deployed as a very effective attacking left back. One area of his game that had been detrimental to his development and the flow of the team is the upon receiving the ball. He had a habit of turning back away from goal in order to protect the ball from the opponent. On the face of it this isn’t necessarily a bad move, however, it appeared totally instinctive. What made it worse is that he did it even when not being marked, leading to attacks slowing down and removing his vision from his attacking space. This may well be a consequence of being deployed as an inverted winger and not being comfortable letting the ball run across his body onto his weaker right foot. However, this season he has tended to do this less often and in doing so, he is becoming a little more direct in his attacking play and causing even more stress for the opposition. He has now represented the England Under 21 squad and he was touted for a move last summer with one club submitting a formal offer for him. However, his father is his mentor and had been working with Ian Holloway to exploit his son’s potential. Now Holloway has moved on, it’s likely that he’ll also leave. Overall, his development is on a rapidly ascending trajectory and arguably he has outgrown this Blackpool side. He needs to be playing in the Premier League to aid his development and if the touted move to Liverpool comes off that may well be excellent for both parties (the player and the buying club), especially given the price that is being mentioned. However, wherever he goes it’s important that he gets game time. Any length of time on a bench will only serve to hold him back. If indeed he is embarking on his final games for Blackpool then it truly has been a pleasure to see such a young talent develop so rapidly and TD can only wish him the best for the future.